According to a website under the domain ‘yourtitanisready.com‘, Respawn Entertainment and VFX Studio Playfight are set to bring live-action Titanfall video content. This seems to tie in with the supposed “future of Titanfall” announcement that was spoke of on Twitter and set to be announced by Microsoft. Playfight is a hot, up and coming IP creative studio specializing in visual effects and post production. Playfight (Video Game High School, Call of Duty: Operation Kingfish) has spent the last few years distinguishing themselves from boutique vfx houses and have transformed into a full in house production studio. Most notably is the mentioned creation of “original content within the vast expanse of the Titanfall universe” – we’re not quite sure what this will be, but action and Titan’s could generate some spectacular content. 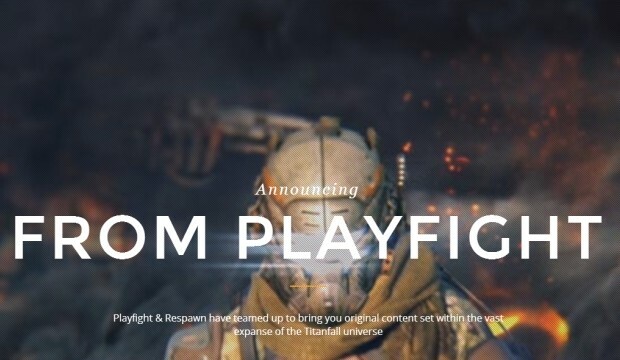 Well versed in commercial and online entertainment, Playfight headed by Director William Chang have begun laying the foundation for the creation of original content within the vast expanse of the Titanfall universe. We should find out more tomorrow at when a Teaser Trailer is set to drop.